Held between 19 May and 18 June 2017, the Ely Cathedral Science Festival was an exciting, month long festival offering visitors the opportunity to take part in interactive experiments and to explore science and the natural world through various mediums including art, music and exhibitions. Open to all ages, this event included science shows, live experiments and talks by leading experts including Professor Robert Winston. Cochranes of Oxford Ltd were delighted to have their Orbit Proview DNA model included in one of these exhibitions. The Orbit Proview DNA Model can be seen here with The Very Rev. 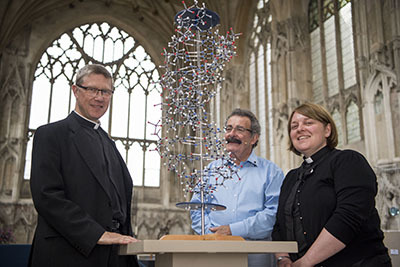 Mark Bonney, Revd Dr Victoria Johnson and Professor Robert Winston.